The American University in Cairo is an independent, English-language, and research university located in Cairo, Egypt. The university offers American-styled learning programs at the undergraduate, graduate and professional levels, along with a continuing education program. The combined effect of these individual inefficiencies was debilitating and established a website redesign as a top priority for AUC. As part of its overall strategy to harness technology as a driver for its strategic goals, AUC began collaborating with Vardot, a Drupal specialized agency in the Middle East, to conceive and create the website that the university’s faculty and students deserved. AUC sought a redesigned and redeveloped website running on a content management system with the capacity to improve site performance in several areas—and Drupal provided the requisite functionality to accomplish this. AUC’s legacy site operated on the combination of an iAPPS CMS, a Sharepoint content hub for microsites, OpenAm server platform, and the wide variety of other software. The combination of a hodgepodge of clashing applications created a fractured website that ultimately hindered AUC’s ability to truly thrive digitally. This made Drupal an ideal choice for AUC’s digital needs: it’s an open source CMS with the ability to handle a large number of pages, content types, and permission levels, while simultaneously affording flexibility and ease of use for users and editors to contribute. Additional factors included the non-existence of a license fee and the extensive reservoir of dynamic modules that are both built and maintained by the Drupal community and by Vardot. The overall objective was to build a public-facing website that enhanced AUC’s visibility as a regional leader in higher education, while concurrently improving user-friendliness and providing students and prospective students with a platform equipped with the digital tools they need to succeed. And finally, the delivered product needed to adhere to best practices for improved search engine visibility. AUC required a site equipped with the SEO infrastructure to attract new visitors and increase pageviews; improve navigation and content management in order to enhance loyalty rates, increase the depth of visit to 2-5 pages, increase average time spent on site, and decrease bounce rate. 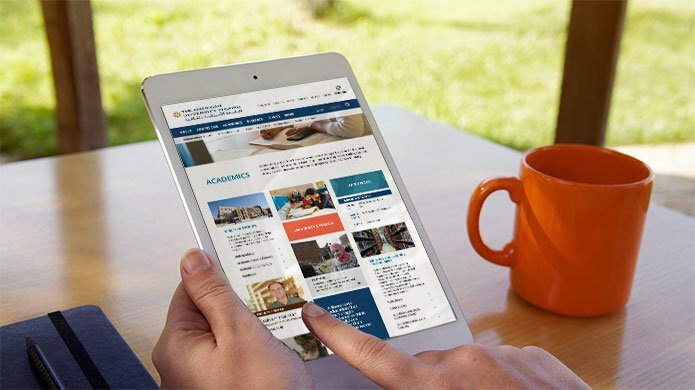 With the goal of revamping the university's website into a streamlined education portal by optimizing the site for mobile, enhancing its SEO capabilities, improving its navigation, and centralizing its resource management infrastructure, Vardot set about providing AUC with the web solution it needed.